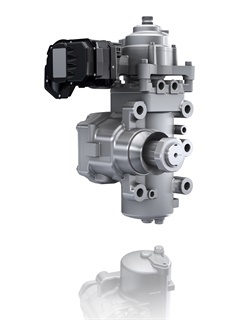 ZF is bringing its Reax electronic steering system to the North American commercial vehicle market. The company demonstrated the system at a press conference at its Commercial Vehicle Technology Center in Lafayette, Indiana, last week. ZF first introduced the product into the recreational vehicle market in 2006 and the global coach and bus market a couple of years later. Since then, ZF engineers have continuously upgraded Reax as other new vehicle technologies have come on line. Today, the system can fully integrate with a host of advanced vehicle systems, including camera, radar, lidar and other advanced safety system and adaptive cruise control enablers, as well as emerging autonomous vehicle control systems. In fact, in its current form, Reax is a Level 2 autonomous vehicle control system designed to assist drivers, boost safety and vehicle control while reducing stress and fatigue. Here’s how it works: Reax features an array of sensors that continuously monitor any incoming telemetry related to how the truck is being steered at both highway speeds and in low-speed maneuvering situations. Watch Jack Roberts try out the Reax in person in this HDT On the Spot video. The easiest way to grasp the Reax concept is to think of the system as an electronic steering control system that boosts a truck’s hydraulic steering pump output. But there’s so much more to the system than that. According to Mark Cartwright, global product marketing planning manager for ZF, Reax is a steering-proportional control, which means that it adjusts how it augments power steering pump output based on actual driver needs. In low-speed situations, Reax lightens up steering resistance to help drivers quickly act and react when maneuvering, backing or docking. At highway speeds, the system tightens up steering resistance to give a driver better feel and precision control in holding a lane. But that’s just the beginning: The system is, as its name suggested, also reactive. This means that it can read specific situational demands and make adjustments accordingly. In low-speed maneuvers, it automatically returns the steering wheel to top dead center if the driver removes his or her hand from the wheel. This, Cartwright said, takes all the guesswork out of getting the wheels straight when backing or docking. But at highway speeds, Reax responds to help drivers deal with crosswinds or crowns in the road that can force them to hold constant pressure on the wheel in order to keep the truck in its lane. In those instances, Reax notes the wheel input and force being exerted on the wheel by the driver and automatically compensates for the difference within a minute or so. In other words, it compensates for the external forces trying to push the truck off its desired steering track and holds the correct course for the driver automatically. This, Cartwright explained, reduces driver fatigue while increasing overall safety for the driver. Reax works in other ways as well. If the truck is fitted with a lane departure warning system, it can help eliminate drift in the lane by reading telemetry off the safety system cameras and other systems. If ReAx senses drift toward one lane marking or the other, it can gently nudge the truck back to its correct position in the center of the lane. Additionally, at highway cruise speeds, when little or no hydraulic system output is needed to handle limited steering wheel movements, ReAx can take over steering control augmentation and allow the steering pump hydraulic pressure to drop to zero flow. This reduces parasitic drag on the engine, Cartwright says, and can add an additional 1.5% boost in vehicle fuel economy when cruising at highway speeds. Driving a Peterbilt Model 579 tractor, I was able to whip the truck through repeated laps on a Figure-8 course using only my index finger to turn the wheel as needed. Another course had me taking a Volvo VHD dump truck over a series of aggressive speed bumps. AF engineers could turn Reax on and off on command, in order to give a sense of how the system can pick up on impact forces from potholes and instantaneously counteract those forces before they get to the steering wheel or the driver. As promised, running over the speed bumps with the system engaged dampened those impact forces so thoroughly, I could take my hand completely off the steering going over the speed bumps while it tracked straight and true. ZF is currently meeting with various truck OEMs and fleets to demonstrate Reax technology and its benefits and hopes to have the system available as either optional or standard equipment in the near future.